Businessbymouse.com is a Local Mobile Search Marketing firm with headquarters in Baltimore, Maryland, USA. We began our existence as an ecommerce website development company in 2003, working almost exclusively with small businesses. It soon became clear that these business owners were not so much looking for web development. What they really wanted was: “To be found in the search engines”. Our company began developing a Search Marketing department in 2005. 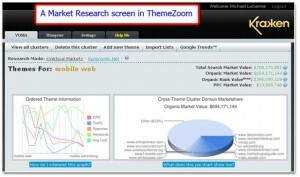 In 2006, we embarked upon an intensive 18-month Keyword & Vertical Market Analysis interactive training with ThemeZoom LLc.. This is a very close-knit “members only” SEO Mastermind Group, the Krakken Agents. 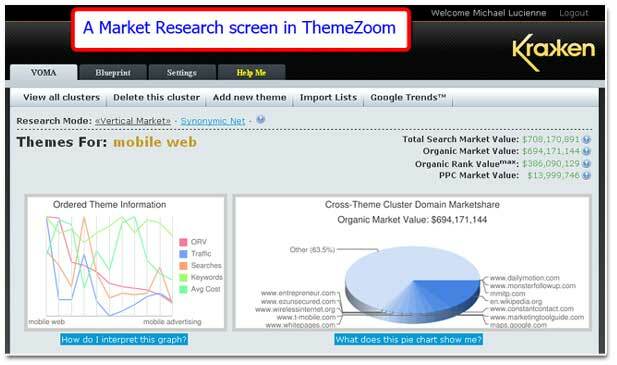 What is the difference between market research and keyword research? Vertical market research should give you a top-down picture of where you want to exist within the larger market frame. For example, if you are selling “insomnia hypnosis audio CD’s” you need to have a full understanding of the “sleep disorder” market as well as the “hypnosis” market before you can decide how to promote within each vertical market. Only a small portion of people in the “hypnosis” market may be looking for “insomnia” CD’s whereas a larger market share of people in the “sleep disorder” market may be interested in your “insomnia hypnosis” website. Until you spend some time researching this, you may be “hacking through the wrong jungle”. We use Themes and Silos for our blueprints. We can develop blueprints for any size company. We also work with existing websites without disrupting any of the services already in place. Our mission is to make SEARCH resources that larger corporations take for granted, available to small businesses. In order to take full advantage of the global marketplace, a company’s online presence management team must be very familiar with the power of search engines as a marketing medium. They must realize that keyword research alone is not enough. In order to dominate the competition, they must do an entire Vertical Market analysis, identifying all of the profitable niches in that market. So too will this analysis highlight any weak areas in a market, allowing the client to avoid spending valuable resources on an area with a questionable ROI. We’ll teach you how to rank higher on any search engine for thousands of your industry’s “money keywords“, and do so by utilizing fewer inbound links. “Money keywords” are the keywords that are already converting to sales on an established website. Fast forward to 2010. Local Mobile marketing is beginning to take center stage. Since this is ideally geared towards small businesses, it just seemed natural that we provide this service to the business community. We now provide Mobile Services to meet that need. Read more here: Go Mobile Or Get Left Behind. (This PDF document will open in a new window). Businessbymouse™ is a search engine (SE) friendly, as a well as a Visitor Enhanced Optimization (VEO) company and as such, we do not engage in any “Black Hat” SEO or other shifty Mobile Search Marketing endeavors. Our goal is to remove the mask of confusion from Local Marketing for you. We know that you are busy and may not have the time to learn the ins and outs of the playing field. We step in and by so doing, allow you to concentrate on the things you should be focusing on, growing your business.